Surf, seafood and... erm, sheep? With direct flights now up and running between Dublin and Newquay Cornwall Airport, here are 10 great reasons to visit England's sunny southwest. The ‘Shaun the Sheep Experience’ opened in February 2015, and saw the famous Land’s End signpost rebranded 'Lamb’s End.' As well as original sets, models and characters from the BAFTA and Academy award-winning productions, there's also an opportunity for visitors to star in a real Shaun the Sheep scene using green-screen technology. The world-renowned two-star Michelin chef Nathan Outlaw opened a new restaurant in Port Isaac on the north coast of Cornwall earlier this year. The spacious and modern restaurant offers diners the chance to enjoy the culinary delights that have made Nathan Outlaw one of the most celebrated fish chefs in the UK. Acclaimed chef Paul Ainsworth, founder of the Michelin-starred restaurant Number 6 in Padstow, will be celebrating the opening of his first accommodation this summer. 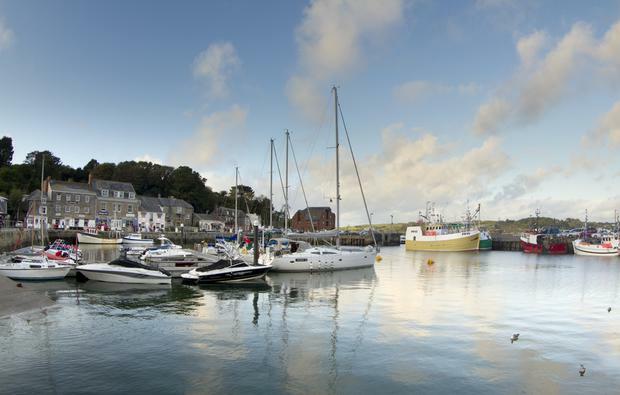 The Padstow Townhouse will feature six luxurious rooms in the heart of Padstow. From May 23 to June 7 a J Class regatta will be taking place in Falmouth. For people wishing to spectate from the water, there will be the chance to get up and close to the action on chartered ribs - an experience not to be missed from land or water. Elton John will be visiting Cornwall on June 16 and 17 for the first time in 30 years to perform at the wonderful surroundings of the Eden Project. The Eden Sessions, which take place every summer, have already hosted the likes of Ellie Goulding, Sigur Ros and Dizzee Rascal. GWR Polo on the Beach takes place on the beautiful beach of Watergate Bay from June 26 - 28 June. Polo is what this weekend is all about, and this year there will be three exciting matches played across the weekend. There will also be lots of other events including Polo demonstrations, beach activities for all the family, a public dog show and live music. One of the leading artisan food festivals in Cornwall, Rock Oyster Festival takes place from 10 July – 11 July at the stunning venue of 17th century Dinham House. As well as the ever-present oysters there will be live music, circus acts, endless kids’ entertainment and alternative performing. Cornwall’s finest local producers will showcase delights from shellfish to steaks and everything in between. So, even if you aren’t a confirmed oyster lover, you can give them a go or opt for something else equally delicious. The Boardmasters Festival (August 5-9) is a brilliant combination of beach sports and live music. This year’s live music offering includes The Darkness and De La Soul. Alongside the tunes, there will be the annual international surf competitions at Fistral Beach – one of the UK’s best surfing beaches. Falmouth Week (August 5-16) is an annual sailing and yachting regatta, and now the largest of its kind in the south west. With plenty of shoreside events, including live music, family games, art galleries and even a display from the Red Arrows, there’s something for everyone to enjoy. Set in one of Cornwall’s most distinctive fishing ports, the Newlyn Fish Festival takes place on the August bank holiday – August 31. Now in its 26th year, it’s a favourite event with locals and visitors alike and packed with fish cooking demos, live entertainment and even a seafood auction, it’s easy to see why. Aer Lingus Regional (aerlingus.com) flies direct from Dublin Airport to Newquay from €29.99pp each-way. There are three flights weekly, increasing to five flights per week – Monday, Tuesday, Friday, Saturday and Sunday – in the peak summer months, from June 27 to September 5, 2015. For more on Cornwall, see visitcornwall.com. England: With 1.75m visits a year, is this our favourite holiday destination?